This is the seventh chapter in the Little Black Book of Scams. Knock, knock! Who’s there? A scammer. Despite living in the digital age, there are still some old fashioned scams that come right to your door, posing a threat to you and to businesses. 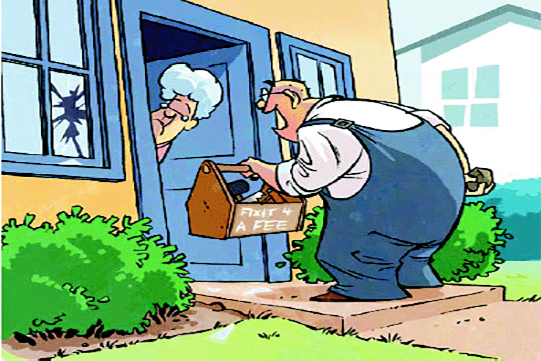 With this trick, door-to-door salespeople use high-pressure tactics to convince you to buy a product or sign up for a service you don’t want or need. These aggressive pitches are often for charitable donations, investment opportunities or home services and maintenance of various appliances, like water heaters and air conditioners. In many cases, you’ll never receive the product or service promised. In others, the products or services are of poor quality or not as represented. ✔ Don’t feel pressured to make a quick decision — take time to do some research on the seller and the products first. ✔ Ask for photo ID, get the name of the person and of the company or charity they represent. ✔ Ask for the charity’s breakdown of where funds are allocated. Be sure to get this in writing. ✔ Never share any personal information or copies of any bills or financial statements. ✔ Only allow access to your property to people you trust. ✔ Research before you invest. Don’t sign anything and always read the fine print. ✔ Know your rights. Contact Consumer Protection for more information on the Consumer Guarantees Act. Scammers have been hard at work over the long weekend, and while New Zealanders were out enjoying the three day break, CERT NZ received a significant spike in reports of webcam blackmail scams. “Scams where attackers claim to have access to people’s webcams tend to go through spikes and that’s what we’re experiencing at present. Over Labour Weekend, CERT NZ received as many reports of webcam blackmail scams in three days as we received in the previous month – the largest spike we’ve seen since CERT NZ was launched in April 2017,” says Declan Ingram, Manager Operations, CERT NZ. “We know that scams like this prey on people being too embarrassed to seek help, so we assume that the reports we’ve received are only the tip of the iceberg. In the reports received by CERT NZ, the blackmail email includes a password that the victim has used in the past and may still be using. The email also claims that the person visited an adult website. The scammer claims to have turned on the victim’s webcam while the victim was on the adult website and recorded what was happening. The scam uses publically leaked information from data breaches to make people think that an attacker has access to their computer or device. If you or someone you know has been affected by a webcam blackmail scam, the best thing to do is to seek help. People can report confidentially to CERT NZ to get help to recover, either at www.cert.govt.nz or by calling 0800 CERT NZ (0800 2378 69). "The scammer claims to have turned on the victim’s webcam while the victim was on the adult website and recorded what was happening."